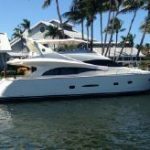 This 2006 Neptunus 72 Flybridge is located in Miami, FL. 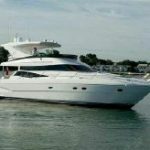 Additional Specs, Equipment and Information: Boat Name TURANGALILA Dimensions LOA: 70 ft 0 in Beam: 18 ft 11 in Minimum Draft: 5 ft 0 in Maximum Draft: 5 ft 2 in Dry Weight: 98000 lbs Engines Total Power: 3100 HP Engine 1: Engine Brand: MTU Year Built: 2006 Engine Model: 10V2000CR M93 Engine Type: Inboard Engine/Fuel Type: Diesel Engine Power: 1550 HP Engine 2: Engine Brand: MTU Year Built: 2006 Engine Model: 10V2000CR M93 Engine Type: Inboard Engine/Fuel Type: Diesel Engine Power: 1550 HP Cruising Speed: 22 knots Maximum Speed: 30 knots Tanks Fresh Water Tanks: (280 Gallons) Fuel Tanks: (1400 Gallons) Holding Tanks: (200 Gallons) Accommodations Number of single berths: 2 Number of double berths: 2 Number of cabins: 3 Number of heads: 5 WALKTHROUGH TURANGALILA may be entered from either the fixed swim platform on a floating dock or any of the four boarding gates on her main deck via the wide walk around side decks. The Integral fixed swim platform has both stainless hoop rails and extra wide steps leading to the Aft Deck on the starboard side. The spacious Aft Deck is 4’ – 5’ longer than her 65/66 Neptunus sister-ships allowing for more comfortable seating. The Trend stainless steel trimmed entry door is offset to port. The spacious Salon has a large custom settee to port and two occasional chairs to starboard. Forward is a custom glass storage cabinet and dry bar followed by a Day Head and side Pilothouse door. To port is the spacious Galley with all stainless steel appliances. Furthest forward is an expansive dining settee. Steps to below on the starboard side lead forward to the VIP Suite, aft to the Master Suite and to port, the Guest Suite. A proper Crew Cabin is aft accessed from the swim platform with an entrance to the Engine Room further forward. 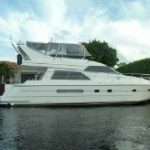 Includes a spacious head and shower within, office set up to port. Comfortable steps lead from the Aft Deck to the Flybridge. An L shaped settee with table is aft to port. Forward is a curved walk behind bar with three stools facing forward. Furthest forward is the all weather Helm protected by a hardtop, and a four side enclosure. This area is air conditioned or heated as needed with two 16000 BTU A/C Units. SALON Entered slightly to starboard the Salon is bright and airy due to several large side windows. Immediately to port is a large camel colored Ultra Leather C shaped sofa with storage below. Twin end tables with table lamps and storage within are mounted in the fore and aft corners. A custom built coffee table with storage lies in front of the sofa. To starboard starting aft is a curved cabinet with a 42” LCD Pioneer TV. Below behind two cherry doors, enclosing the entertainment center is the following equipment: Bose Lifestyle 48 AM/FM/CD/DVD w/hard drive storage for music & movies Direct TV Sat receiver for Salon & Crew TV Glomex terrestrial TV attenuator Sea Tel Sat TV control panel A/B switch for cable TV Forward are two swivel chairs with a round front cherry end table with a table lamp above & storage below, four sliding door storage cabinets are outboard under the cabin side windows. An attractive tray ceiling feature is above the coffee table. The large cabin side windows are covered with both Hunter Douglas Silhouette shades and Roman shades. There is a Bose five channel speaker system with a hidden sub-woofer. Overhead are 13 LED lights, most on a dimmer. A CO detector and central vac outlet are also in this area. Air conditioning is delivered through a portside soffit above the windows. A large Companionway leads forward on the starboard side to the Storage Bar ware Area and Galley. Going forward from the Salon is a very wide Companionway with a corner cabinet to starboard. Behind two upper curved cherry doors is a stemware cabinet housing wine glasses on plexiglass cut shelves. The cabinet is lit from within for a very nice effect. Below the counter top is are two cherry cabinets for bar ware storage. 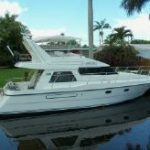 DAY HEAD Just forward of the Bar Area and adjacent to the Galley is a compact Day Head which has a rounded cherry vanity with an under mount stainless sink, a compact Headhunter Royal Flush toilet and a marble sole. The overhead is mirrored and has two halogen mini spots. GALLEY The Galley is open on two sides allowing the cook to be very much a part of the conversation elsewhere on the main deck. The sole is black Galaxy granite tile. The countertops are Volcanic Expression Karadan. The appliances in the Galley are upgraded stainless steel. Equipment in the Galley is as follows: GE Profile 3 door refrigerator/freezer Miele stainless steel trimmed 4 burner Ceran top cook top Miele oven/convection oven GE Profile stainless steel microwave w/work light & fan Bosch stainless steel interior dishwasher Double under mount stainless steel sink Insinkerator garbage disposal (11) Cherry cabinets (4) Cherry drawers (2) Pullout storage cabinets Cherry backsplash Two tone cabinet latches Insinkerator Instahot water tap (4) Under counter lights Soffit type AC delivery (5) Overhead halogen LED lights Sink faucet with pullout spray DINING AREA Forward and up two steps from the Galley is the raised Dining Area spanning nearly the full beam of the yacht. There is seating for eight. The seat bottom is grey Ultra Leather with the seat backs a fabric brocade. The table is high gloss cherry upon a cherry pedestal with folding leaves and two storage cabinets below. All the way forward is a storage locker which contains the Flybridge electronics battery, a battery charger and additional storage space. Facing the dinette from the starboard side is a 17” Sharp Aquos LCD TV. Forward under the windshield area is a large storage locker. Overhead are nine halogen mini spots. A CO detector is also in this area. The sole of this area is custom stained cherry hardwood. 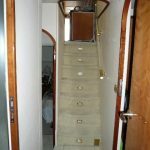 ACCOMMODATION COMPANIONWAY Down six carpeted steps to the Lower Deck Accommodations. On the way below is a two cherry door locker housing the main AC and DC electrical panels. Forward is the VIP. 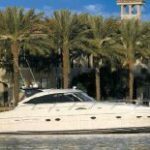 To port is the Guest Cabin and aft is the Master Cabin each with an arched cherry entry door. On the way to the Master Cabin are two steps going down. Inboard is a door to a walk in Laundry Room housing the Whirlpool Thin Twin washer dryer combo and additional storage. VIP CABIN All the way forward is the VIP Cabin with a centerline queen size berth off the forward bulkhead. An Ultra Suede upholstered headboard is at the head of the berth. Below the berth are four storage drawers and rope lighting around the perimeter. Above the berth are halogen reading lights and a Lewmar deck hatch with an Ocean Air sliding screen and cover. Countertops both port and starboard at the level of the berth serve as nightstands. Above each countertop is an opening stainless steel trimmed porthole with Roman shades and rope lights behind the valance. Above the porthole on both the port and starboard sides are eight cherry cabinets. Aft to starboard is a double door auto lit cedar lined hanging locker. To port is a half height cedar lined auto lit hanging locker with two cherry drawers below. Aft is the entrance to the VIP Head via an arched cherry door and a 15” Sharp Aquos LCD TV affixed to the aft bulkhead. Also in this cabin is a central vacuum outlet, DVD player, digital AC controls, CO detector, five LED lights, Bose stereo speakers and an oversize access hatch to the bow thruster area. VIP HEAD The VIP Head is aft to port. The cherry bow front vanity has an under mount china sink under a “Sky Glass” Avonite countertop. Three mirrored medicine cabinet doors are above. The sole is Botticino Classico marble. The head is a full size Royal Flush by Headhunter. The stall shower has a clear tempered glass door, a hand held or wall mountable fixture plus a light and exhaust fan. Also within the Head is a mirrored overhead, two halogen mini spots and an arched entrance door. GUEST CABIN Entrance to this cabin is from the aft end with the berths forward. There are two twin berths on the forward bulkhead with a three drawer nightstand with table lamp between. Twin padded headboards are affixed to mirrored panels forward. There are two small and one large drawer beneath each berth. On the forward bulkhead above the headboards are six cherry storage cabinets. Above the outboard berth is a shelf with two opening stainless steel portholes covered by Roman shades. Above the portholes are six additional cherry storage cabinets. At the foot of the inboard berth is a Sharp Aquos 15” LCD TV in a cherry cabinet with Bose speakers with Bose Link system. Just as you enter the cabin is a full size cedar lined auto lit hanging locker with two drawers below. Aft is the access to the Guest Head via an arched cherry door. Also in this cabin is a CO detector, Bose stereo speakers and five LED lights. GUEST HEAD The Guest Head is aft to port. The cherry bow front vanity has an under mount china sink under a Cobalt Blue Karadon countertop. The sole is Botticino Classico marble to match the countertop. The head is a full size Royal Flush by Headhunter. The stall shower has a clear tempered glass door, a hand held or wall mountable fixture plus a light and exhaust fan. Also within the Head is a mirrored overhead, an opening stainless steel porthole, two halogen mini spots and an arched entrance door. MASTER CABIN Entering from the forward end, the king size berth is on the aft bulkhead with an upholstered headboard affixed to a large mirrored panel. Two cherry columns with sconce lights rise from the three drawer nightstands either side of the berth. There is rope lighting around the perimeter of the berth. At the foot of the berth is the entertainment center with a 32” Samsung LCD TV and two cherry cabinet doors below. A custom third two door hanging locker is outboard of the TV. To port is a pecan Ultra Leather settee with three drawers forward and three drawers aft. Two opening stainless steel portholes with Roman shades are above. Next aft is a full size cedar lined auto lit hanging locker, followed by a walk in cedar lined locker with a full size dressing mirror and a three door mica cabinet. To starboard is a bureau with nine cherry drawers, two portholes, Roman shades, drapes and a second full size cedar lined auto lit hanging locker. Aft to starboard is the entrance to the Master Head via an arched cherry door. Also in the Master is an attractive ceiling treatment with mirrors, vinyl panels and cherry trim with concealed rope lighting and four halogen mini spots, a CO detector, digital AC controls and Bose stereo speakers with a dedicated Bose Lifestyle 48 system. AC delivery is via a starboard side valance with hidden rope lighting. Eleven additional LED lights provide plenty of lighting. MASTER HEAD The size of the Master Head is very generous and not properly described by the word “Head”. The sole is Botticino Classico marble with Black Star inlays to compliment the Black Star Galaxy granite countertops. The outboard vanity has three drawers and a pull out stool to port. Extending inboard the vanity has two double door bow front cabinets under each sink. White china sinks are under mounted on the granite countertop. The area above the sinks and much of the area to starboard is mirrored including two additional mirrored storage cabinets on the starboard side. The toilet is a Headhunter Royal Flush model. The shower is huge and includes a seat, a handheld or wall mountable Grohe fixture, an exhaust fan and two lights. The shower door is clear tempered glass and includes an even larger sidelight. The overhead is mirrored throughout. Within the Head there are five LED lights, ample GFCI protected outlets and two tone fixtures. An opening stainless steel porthole is covered with a Duette shade. FOREDECK Fiberglass non skid deck Raised bulwarks w/stainless steel bow & side deck rails Bollard type cleats w/hawse holes forward Recessed Maxwell 3500 windlass w/freshwater wash down, up & down foot switches & hinged cover Stainless steel anchor chute Lewmar Delta stainless steel 110 lb. anchor w/all chain rode 200′ Bow sun pad w/removable cushions Lewmar tinted plexiglass deck hatch to anchor locker (5) Port & (5) starboard LED mini deck lights Port & starboard midship boarding gates w/hinged door & rail breaks Starboard side entry door White Textulene windshield cover for forward & side windshields Dual port & starboard Bollard type spring line cleats International navigation lights Frameless cabin side windows on house sides Stainless steel safety rail at house sides Delta T side deck air intakes Khalenberg dual trumpet air horns Portside storage hinged cabinet in house deck AFT DECK Fiberglass nonskid decks Aft Deck built in bench seating for four to five people w/removable Sunbrella cushions & stamoid cover High gloss cherry wood table w/dual stainless steel pedestals & cover (4) Varnished teak arm chairs w/matching Sunbrella seat bottoms Isotherm stainless steel drink refrigerator at Aft Deck bar Electric Chef stainless steel BBQ at Aft Deck bar (upgraded) Stainless steel under mount sink w/hot & cold taps plus sink cover Norcold fridge & icemaker combo at bar Storage cabinet in bar w/Avonite top w/white Stamoid cover to enclose the bar Trend stainless steel entry door w/dark tinted glass Clarion stereo remote (2) Pylaster area cabinets, portside w/engine/thruster controls, starboard upgraded to include engine/thruster controls Port & starboard Aft Deck boarding gates w/rail break (2) Bollard type Aft Deck cleats Starboard side stainless steel hinged boarding gate from swim platform (4) Fiberglass nonskid steps down to swim platform Integral nonskid fiberglass swim platform Watertight door to Crew Cabin & Engine Room Swim platform freshwater wash down spigot Swim platform hot & cold water shower (2) Stainless steel stern cleats (3) Stainless steel removable safety rails aft Port & starboard 50 amp 220 volt cable master lockers (2) Marinco cable TV/phone inlets (5) LED step lights (5) Overhead stainless steel trimmed halogen Aft Deck overhead lights (2) Aft deck CCTV cameras Ample stainless steel safety handrails (2) Clarion 2 stage stereo speakers (4) Underwater lights (2) Stainless steel fender holders on Aft Deck (2) Extra Aft Deck, deck drains all w/oversize overhead tubing FLYBRIDGE EQUIPMENT Hinged two piece fiberglass hatch to cover steps up to Flybridge Fiberglass non-skid decks Safety rail at bridge steps (2) Lewmar opening hatch skylights (9) Overhead stainless steel trimmed overhead lights (2) JL Audio stereo speakers (2) Bose stereo speakers L shaped seating for 5 to 6 people with custom removable cushions, covers & storage below Brazilian Blue Avonite table at settee w/(2) stainless steel bases Centered Brazilian Blue Avonite two level bar top, stainless steel rail, (3) navy Ultra Leather bar stools, under mount stainless steel sink w/cover, trash receptacle w/cover & (3) large storage cabinets. Also in bar facing forward is a stainless steel Viking wine cooler, a stainless steel Viking drink fridge & an icemaker Marquipt 1500 lb. tender davit on portside for portside tender launching Stainless steel & teak step ladder to Coach Roof Integral deck drains on boat deck to waterline (12) Panel clear vinyl four side enclosure, w/(8) U Zips, opens to pin to overhead as desired Hardtop w/radar arch supports aft Oversize dark tinted wrap around Venturi windscreen (11) LED courtesy lights on bridge perimeter Winslow life raft, 6 person w/hydrostatic release ACR EPIRB HELM EQUIPMENT Centerline helm w/Sea Star tilt varnished wheel (3) Admiral Blue upholstered Stidd helm chairs Footrests on all three helm seats Garmin 7215 GPS/plotter/radar (2015) (2) MTU LCD ECM engine monitors Simrad 15” CX54 72 mile radar/plotter Raymarine ST60 speed/depth Ritchie 5” Power Damp magnetic compass MTU electronic engine controls Naiad Integral bow & stern thruster controls Simrad AP25 autopilot Icom M602 VHF w/DSC MTU key start/stop panels (2) ACR UPP 102 Point Pad searchlight controls Naiad Multi Sea II stabilizer panel Fireboy engine shutdown bypass panel Bennett trim tab control panel Fusion Sirius ready AM/FM/CD stereo w/iPhone & iPod connections 6 Station bilge pump control panel w/alarm & (3) bilge pump counters 12V Accessory outlet Marine Air digital AC controls Windlass switches at Helm (3) Wema fuel tank electric gauges (2) Stainless steel grab rails at helm Tempered safety glass at center helm w/windshield wiper/washer Horn button (3) Storage cabinets under helm to large storage area 12 Volt electronics panel w/(30) breaker protected circuits 12V digital voltmeter & digital amp meter Panasonic Data Systems controller for CCTV cameras Simrad AIS 80 AIS system Helm cover COACH ROOF EQUIPMENT (2) ACR searchlights Garmin 5’ Open array HD 12 KW radar antenna Simrad 4’ 6 KW open array radar antenna Speco hailer horn Sea Tel Sat TV dome Fold down signal mast w/(2) stainless steel halogen lights (3) GPS antennas Glomex terrestrial TV antenna Aft facing quartz light on mast for Boat Deck Courtesy flag halyard (2) VHF antennas Cell phone antenna FM Antenna XM Sat radio/weather antenna Removable stainless steel ladder for Coach Roof access (2) Lewmar deck hatches CREW AREA Down three steps with storage under from the swim platform entry door is the Crew Area. To starboard is the Crew Cabin with a single bunk off the starboard forward bulkhead and a GE refrigerator. The bunk has two drawers below. A hanging locker is adjacent. Also in the cabin is an opening stainless steel porthole with a Duette shade, digital SMX II AC controls, CO detector, Bose stereo speakers and a laminate wood sole. Three halogen mini spots are above and a 22” Sharp LCD TV/DVD combo is placed where it can be seen from both berths. The centerline companionway has a cedar lined wet locker, storage in the sole and the watertight door to the Engine Room. The sole is new Amtico vinyl. To port is an open desk area with a Corian top, three storage drawers, another cedar lined hanging locker, two desk drawers and two lockable hanging file drawers. A shelf with all the yacht’s manuals is also in this area. An Icom 602 VHF and the yacht’s printer are in this area. CREW HEAD To port is the private Crew Head. There is a vanity with cherry storage below and under mount sink in an Avonite countertop with two mirrored medicine cabinets above. The toilet is a compact Headhunter Royal Flush model. The sole is Amtico vinyl. The stall shower has a clear Lucite door. It includes a light and a handheld or wall mountable shower fixture. ENGINE ROOM (6) Point Oil Exchanger oil change system – mains, generators & transmissions Freshwater hot & cold water spigots w/hose Dual Sea Pro 300 main engine fuel filters w/vacuum gauges Fireboy FE 241 60 lb. fire suppression system Reverso fuel polishing system w/Racor 1000 fuel filter/fuel magnet, timer @7 gpm filter rate (2) Main engine CRS 3000coolant recovery bottles Naiad 252 stabilizer system Sea Star hydraulic steering reservoir & power steering system, pumps on both engines Airsep crankcase ventilation system Black fiberglass wrapped dry exhaust (new 2013) system w/downstream water injection 6 Step Marquipt Tide Ride ladder w/handrail stowed in Engine Room Neptunus 4 step stainless steel & teak tread vertical boarding/swim ladder stored in Engine Room Grafite shaft bonding brushes tied into central bonding system Central vacuum system (2) Fantech 110V Engine Room blowers w/12V extractor fan (2) AC fluorescent overhead lights (4) DC incandescent overhead lights (2) Generator coolant recovery bottles (2) 72,000 BTU Cruiseair chilled water air conditioning compressors Fuel tanks as follows: 540 gallon forward tank 430 gallon port tank 430 gallon starboard tank (2) Jabsco VR 100 fuel transfer pumps w/manifold pumps 25 gal/min transfer rate 3” Stainless steel propeller shafts ZF 2050A 2.029 to transmission ratios Tides dripless shaft seals (6) Rule bilge pumps Village Marine 900 GPD watermaker (2) Engine Room cameras w/Flybridge display (2) 16,000 BTU direct expansion air conditioners on Flybridge Propellers are 34” x 43”, 4 blade (4) Underwater Sea Vision lights Crash pumps on both engines (2) Mounted spare props Spare shaft mounted in Engine Room Site gauges on Engine Room fuel tanks Sea Land macerator pump Naiad 20 HP hydraulic bow thruster Naiad 20 HP hydraulic stern thruster (2) Racor 500 fuel filters for generators Workbench w/vise on top of port generator Macerator pump w/timer Fuel priming pump (2) Gas/water separators for generator exhaust Panasonic CCTV camera MECHANICAL EQUIPMENT LOCATED ELSEWHERE Windlass breaker in forward bilge (2) 30 Gallon Raritan hot water heaters in forward bilge (2) Head Hunter Mach 5 110V house water pumps in forward bilge ELECTRICAL 12V/24V DC electrical system 120V/240V AC electrical system 27.5 KW Northern Lights genset in sound cover, 830 hours port 27.5 KW Northern Lights genset in sound cover, 672 hours starboard (2) Battery cutoff switches Parallel switch Victron Centaur 24 volt 100 amp house battery charger Victron Centaur 24 volt 30 amp engine battery charger Victron Centaur 12 volt 30 amp generator battery charger Victron Centaur 12 volt 30 amp electronics battery charger (2) Group 31 generator batteries Parallel system for house & engine batteries Parallel system for thrusters Main electrical panel w/the following: (23) Breaker protected 220 volt double pole circuits (48) Breaker protected 120 volt circuits (48) Breaker protected 24 volt circuits (2) AC digital voltmeters (2) AC digital amp meters Digital frequency meter Generator start/stop panel for both generators Water tank gauge at electrical panel Waste tank gauge at electrical panel Bilge pump alarm at electrical panel Cruiseair chilled water digital control panel at main electrical panel Battery switch for bow thruster (2) Galvanic isolators (2) 50 Amp Glendinning shore cord cable reels aft (2) 15 KVA 50 amp isolation transformers 12 Volt battery w/60 amp charger dedicated to Flybridge electronics Batteries as follows: Engine (2) 4D 165 Ah Gel Cell, new Jan ’16 House (4) 8D 235 Ah Gel Cell, new Jan ’16 (2) Group 31 batteries for bow thrusters Starboard generator has new raw water pump, Jan ’16 REMARKS TURANGALILA was conceived and designed for her current and only owner. Countless hours went into the refinement and improvement of her layout and equipment via visiting previous 70’ Neptunus builds. Her owners have maintained her with an open checkbook policy. Most recent haul out and bottom service July 2016. Come inspect TURANGALILA and see for yourself. Owner’s new yacht under construction dictating the sale of his 70’ Neptunus. The name TURANGALILA is reserved.